Stand up for the GNU GPL! (slides available for download) by Karen Sandler, executive director of Software Freedom Conservancy. Karen shares an account of Conservancy's support for Christoph Hellwig's recent suit against VMWare to defend the GNU General Public License. Free software, free hardware, and other things by Richard Stallman, founder of the Free Software Foundation. Richard gives his take on some major issues facing the world of free software and explains how the free software philosophy extends to hardware. Let's encrypt by Seth Schoen, senior staff technologist at the Electronic Frontier Foundation. Let's Encrypt is a robotic certificate authority that will soon issue publicly-trusted certificates, at no charge, by the millions. Style or substance? Free software is totally the 80's by Deb Nicholson of the Open Invention Network, OpenHatch, and GNU MediaGoblin. Deb discusses the need to look at free software development from a long-term perspective, focusing on robust designs. Federation and GNU by Chris Webber, lead developer of GNU MediaGoblin. Federation refers to the loose networking relationship that allows the creation of decentralized Web systems like GNU MediaGoblin, pump.io, and GNU social. Want more info about a session? Full descriptions are up on the LibrePlanet 2015 Web site. There are many more videos on their way from the 2015 conference; we wish we could have them all up today, but some are still being prepared. 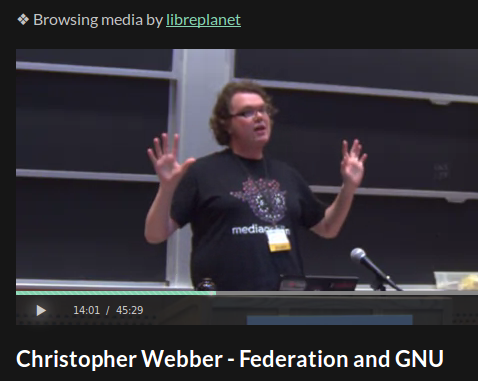 All published videos are hosted on , our instance of the publishing platform GNU MediaGoblin, which also includes videos from LibrePlanet 2014 and 2013. Finally, we want to say thanks again to all the volunteers who worked hard designing and running our free software streaming and recording system and transcoding and editing the videos. You keep LibrePlanet spinning!